Photographs by the likes of Gordon Parks and Diane Arbus are now on display at Toronto's Art Gallery of Ontario, part of the AGO's latest exhibition, Outsiders: American Photography and Film 1950s-1980s. But what if those famous images were made out of Play-Doh? Follow @eleanormacnair on Instagram. The artist takes the work of photography masters and sculpts them into colourful (and 100 per cent non-toxic) Play-Doh scenes. Eleanor Macnair makes art that's non-irritating, non-allergenic and 100 per cent non-toxic. Play-Doh is her medium of choice, and since 2013 she's interpreted art-history's greatest photographs with the colourful clay. On Instagram, though, Macnair shares her whole process. And just like when you were in kindergarten, once a picture is finished, she squishes every doughy tree, skyscraper or eyelash back in the can before it dries up. Like a moment caught on camera, these images are fleeting. "I like the fact that they are ephemeral," Macnair tells CBC Arts by e-mail, "I'm the only one who sees them in their 3D state." When Macnair makes one of her sculptures, black-and-white photographs are rendered in "lurid colour." It's pretty much impossible to black and white Play-Doh, but there's more to it than that. On the Internet you need a load of crazy colour if you're going to capture the world's diminishing attention span. "Viewers then hopefully go on to discover and appreciate the original photograph," Macnair says, and every post on her blog links back to the source material. Every image is an invitation to fall down a rabbit hole of art history. It's both jarring and delightful to see a Cindy Sherman or a Man Ray or a William Eggleston rolled out of childhood craft supplies, and looking at Macnair's pictures, you'll no doubt question how well you remember the original. Each post begs a repeat viewing, both of the source photo and its Play-Doh double. In terms of what you can learn about Canadian art, Vancouver's Jeff Wall gets the Play-Doh treatment. Check out Macnair's take on "A Sudden Gust of Wind (after Hokusai)." 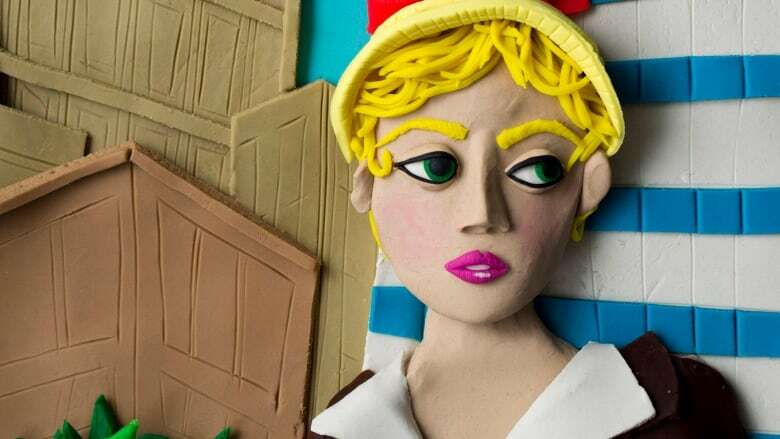 We're anticipating Play-Doh portraits of Scandinavian voyageurs on her Instagram any day now, because just like CBC Arts, Macnair is a major fan of Toronto's Naomi Harris, particularly her series, EUSA. Who Instagrammed it better — photographer Naomi Harris or her furry sidekick? "I love [Edward] Burtynsky," she says of the recent Governor General's Award recipient, though we're less hopeful for a recreation of anything from the Water series. "Some things don't work well in Play-Doh," says Macnair, "like landscapes and open mouths. You'll notice that the mouths in all my portraits are closed." "There are millions and millions of photographs in the world," says Macnair, so when she mines museum archives for inspiration, she tries to create a balance — paying attention to different subjects and composition, and also mixing contemporary photographs with what you'll find in the history books. Says Macnair: "I'm really interested in our consumption of images every day and how many we view without really looking."